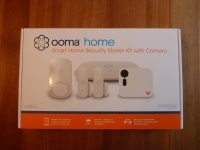 First we will cover the Ooma home Smart Home Security Starter Kit with Camera. The full color box is fairly large, but it does a very good job of keeping all of the components in place and secured from damage. 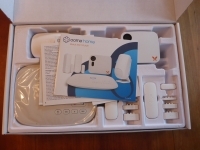 On the cover you'll find pictures of the major components inside which include the Ooma home base, an Ooma home motion sensor, (2) Ooma home door/window sensors, and a Butterfleye security camera. 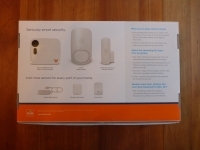 The back of the box details some of the features mentioned previously as well as shows a few additional sensors you can purchase to add to your system. 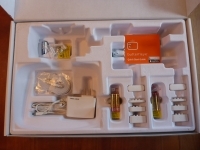 One end of the box mentions the contents of the kit, requirements to use the kit and mentions a 1 year warranty. The other end of the box discusses the low cost, fair and honest pricing, and ease of install. Flipping the lid of the box you'll find some info like the Quick Start Guide laying on top of the kit. 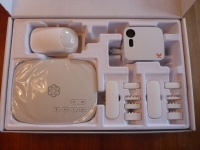 In the front left you will find the Ooma Telo Hub, behind that is a motion sensor, front right are the (2) door/window sensors and in the back right you'll find the Butterfleye camera. Lifting the main pieces out of the cardboard tray and you'll find additional accessories for each like batteries, power supplies, and hardware but I will details those parts below. The heart of this system is the Ooma Telo Hub which is supplied with a 3A PSU and a flat Ethernet cord. The motion sensor is supplied with a removable stand, some double stick adhesive pads for mounting as well as a few screws and wall anchors for the same purpose. 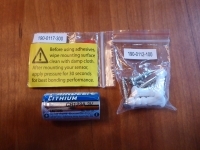 Also included is the CR123A battery. 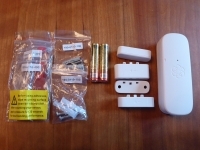 The door/window sensors are supplied with the parts shown below (for one sensor). The sensing unit comes with (2) AAA batteries, a magnetic "latch", and several spacers for the magnet to properly align it with the sensor. Also included are various double stick pads and screws with anchors for both the sensing unit and the magnet. The camera comes with a 120V adapter, a USB cable and a quick start guide.